The Electoral Commission of SA (IEC) has had its voters' roll certified and the number of eligible voters stands at 26.75m - representing a 1.3m increase in the number of people who registered to vote in 2014. The IEC said in a statement on Friday that since its inception ahead of the 1999 national and provincial elections, the voters' roll has shown steady growth of more than 47% and currently contains the most registered voters. Of the total number of eligible voters for the May 8 elections, 55% are women. Gauteng has the highest number of registered voters at 6.3m or 23.8% of the total number of national voters. According to the IEC, Gauteng is followed by KwaZulu-Natal with 5.5m eligible voters (20.6%), and the Eastern Cape with 3.3m voters (12.5%). The Northern Cape has the lowest number of registered voters accounting for just 2% of the country's voters, with just over 600 000 registrations. Adults aged between 30 and 39 account for almost 25% of the voters' roll. Almost 700 000 of them are registered to cast their votes. 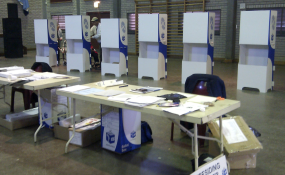 In provincial elections, 36 parties have been certified to contest for the Gauteng legislature, 34 for the Western Cape and Limpopo, and 31 for KwaZulu-Natal. Mpumalanga and the Free State have 28 registered parties while the Northern Cape has 21, despite low voter registration turnout. The North West has 29 parties battling it out for votes, and in the Eastern Cape there are 26. Just over 29 000 South Africans living outside the country have been given the green light to vote. IEC spokesperson Kate Bapela has reminded voters to remember to take along their identity documents - either a green barcoded ID, a smartcard or a valid temporary ID certificate - to cast their votes come election day. According to chief electoral officer Sy Mamabolo, 48 political parties are expected to contest the national elections on May 8.